the Camera — And Us! 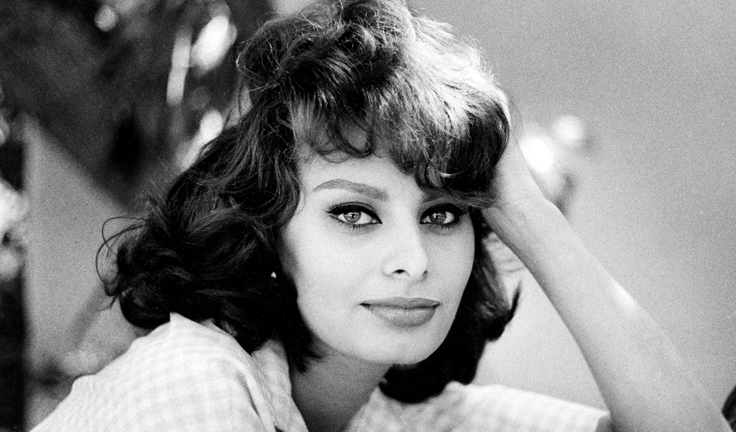 Sophia Loren is one of those wonders of the world that arrives so gloriously on the world stage that she seems singlehandedly to prove the existence of a divine creator. 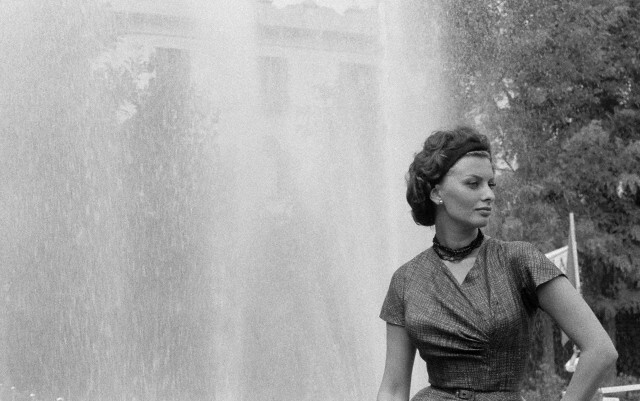 Born near Naples, Italy in 1934, Sofia Villani Scicolone had to endure the terrors of World War II, but her timing wasn’t all bad, as her career would be launched in a golden age of Italian cinema. Her parents never married, and Sophia and her sister, Maria, were raised in Naples by a single mother. History surrounded them, and in their way, they made history. In a curious footnote to Italy’s tortured political narrative, Maria married the son of Italian dictator Benito Mussolini. But it was Sophia who made a cultural impact never quite seen before, or since, by an Italian actress. She became her country’s cinematic patron saint, and exported her powerful survivor’s spirit and incandescent glamour to the world. The match that started the fire was a beauty pageant that Loren entered at the age of fourteen. She didn’t win (we’d like a recount! ), but that first step into the public eye did lead to acting lessons, and from there, small movie parts for most of a decade. By the late 1950s, she had caught the eye of Paramount, landed a five-picture deal, and hit the States, bringing her own smoldering Mt. Vesuvius quality with her. Once she got to America, she began to pick up—and generate—real steam, felling male co-stars and audiences with her strong, and highly un-Puritanical, exoticism. 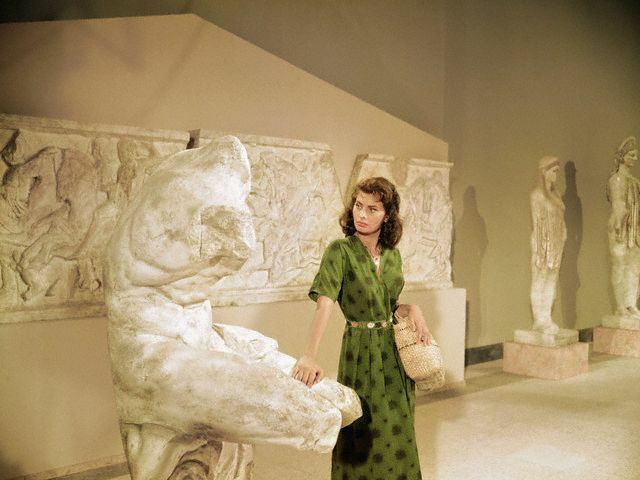 Ironically, after a string of popular successes in English, her finest hour came in her native Italian, stripped of makeup and designer dresses, with “Two Women” (1960), Vittorio de Sica’s wrenching story of a mother trying to protect her daughter during World War 2. Her playing against type paid off: Loren was awarded a Best Actress Oscar, the first ever given for a role in a foreign language. 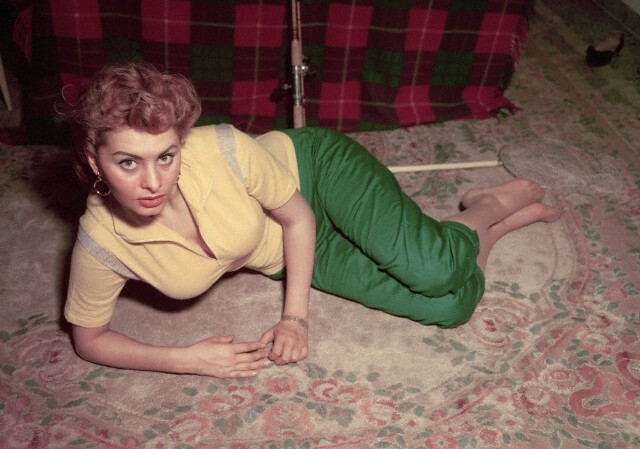 “Two Women” brought to light Loren’s formidable talent, and opened up new roles for her on both sides of the Atlantic. Her love life, for a time, was equally dramatic. The much older Cary Grant, with whom she made “The Pride and the Passion” (1957) and “Houseboat” (1958), fell deeply in love with Loren, but in her own words, theirs was a “doomed” love affair. Grant proposed marriage to her, even though he was married at the time to actress Betsy Drake. In the end, Loren married the man she felt knew and understood her best: Italian director Carlo Ponti, whom she first met when she was fifteen. 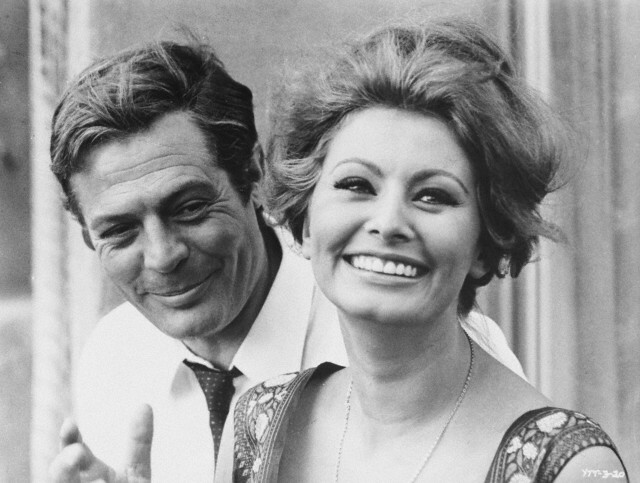 Ponti divorced his first wife and married Loren in 1957, but Catholic Italy refused to recognize their union, annulling the marriage in 1962. (Finally, Ponti and Loren became French citizens, and the couple re-married in 1966.) 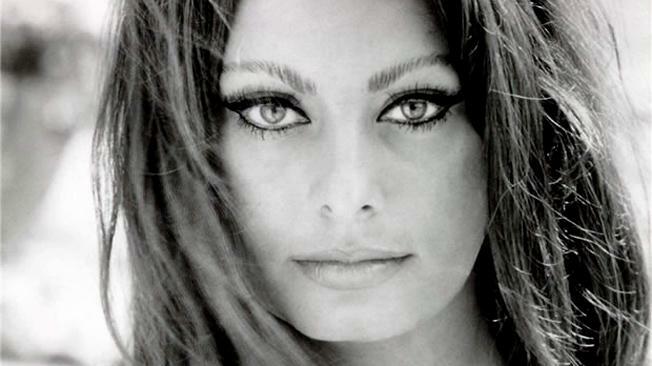 Loren then scaled back on her acting career in the early 1970s to raise their two sons. She and her husband remained together until his death in 2007. What's she doing down there? Coming of age, 1954. Watch out, world. The emerging bombshell, 1954. As Cleopatra. Antony doesn’t stand a chance. Neither do we. Romanesque: the sun shines on Sophia in Italy...and everywhere else, for that matter. I’m sorry, did somebody say something? We were too distracted to listen. 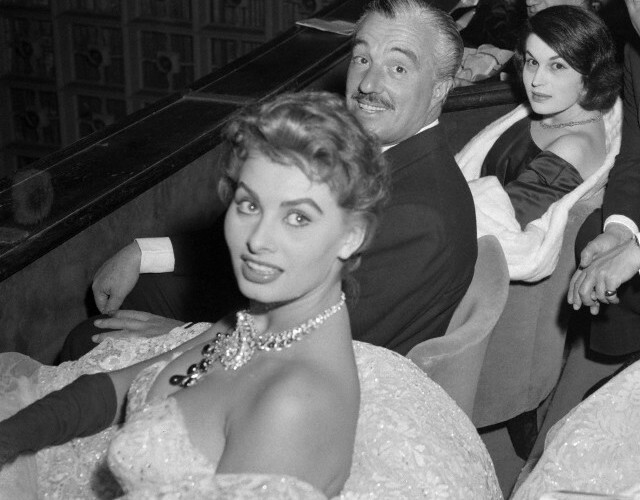 On the town, décolleté, with director Vittorio de Sica. Lucky fellow. Fresh from a swim and not a drop less glamorous. Need a towel, dear? Shooting “El Cid” (1961), conquering Spain just as she'd conquered Italy. And no wonder. 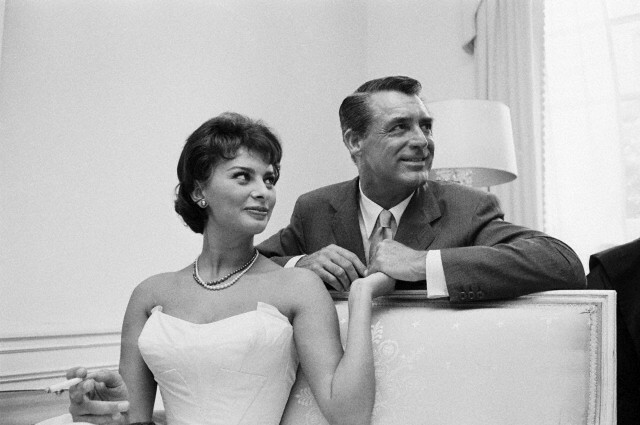 With Cary Grant in 1956. Theirs was an affair of the heart, and Loren still has all his love letters. Now that would be an interesting read. One work of art regards another. I prefer the one in the green dress. Sophia’s charisma is never caught napping. Move over a smidge, would you? Making pizza. 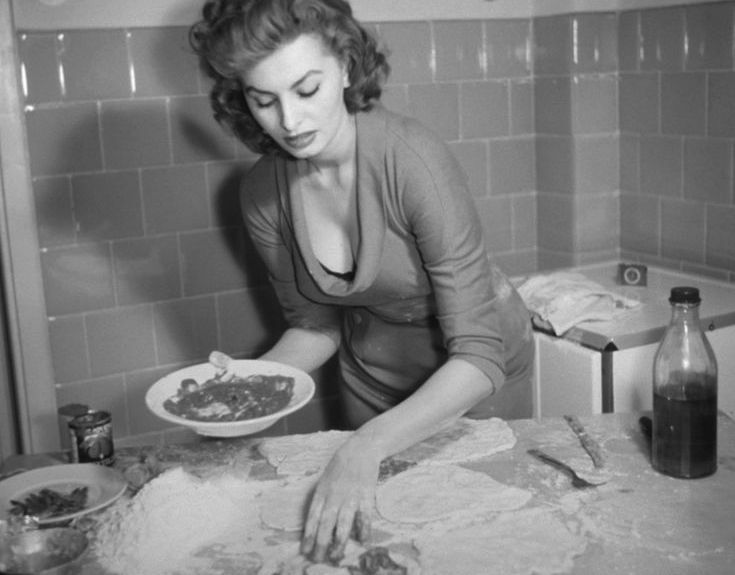 Can one maintain a figure like Sophia’s with, as was often claimed, “spaghetti?” It is awfully nice to think so. Fountain of youth: Loren, fresh and elegant. 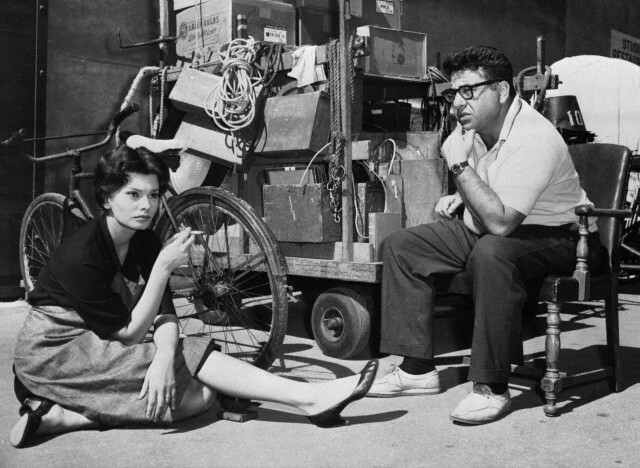 Sophia taking a break between takes in 1959. Cigarettes never hurt her health! Um, uh…sorry. Lost the power of speech. 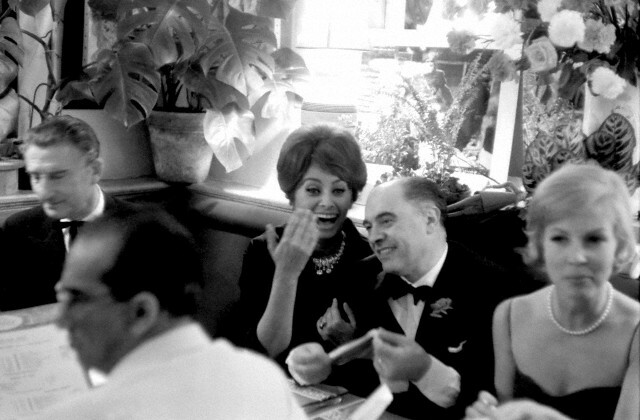 The life and soul of the party—and what a soul—out and about in 1961, with husband Carlo Ponti. Sounds silly but it's true: many, many men wish that they were those wreaths of smoke. An ideal pairing: with co-star Marcello Mastroianni, 1963. Walk this way. Honey, if we could walk that way, all our problems would be over. No need for the Italian-English dictionary here! Okay is OK, in the international language of fingers. As are a few other words. 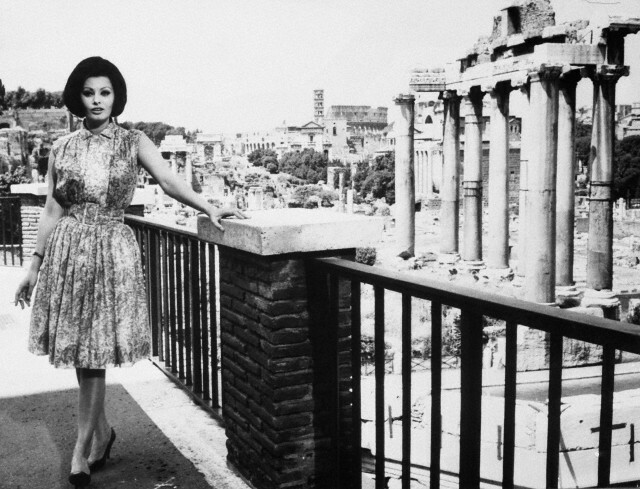 Built to stand the test of time: Rome and Sophia. Did we mention that Sophia’s legs look as good as the rest of her? We didn’t? Well, then, here you go. You’re welcome.